Entering his third game in league play of the 38th Myeongin without a single win, Lee Changho (9P) managed a victory last Tuesday, defeating Baek Hongsuk (7P). 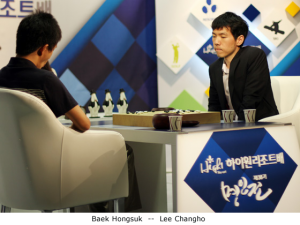 It was a decisive victory for Lee Changho, with Baek Hongsuk resigning after only 103 moves. Lee Changho’s next league game will be against Kim Seongjae (4P), on July 6th, and his final league game will be against Lee Sedol (9P), at a date to be announced.